A couple of expected Feb dividends weren’t paid until 1st March, so the total income received was £52.13. 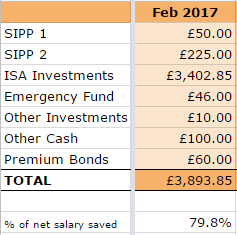 In February 2016, I received only £29.81. 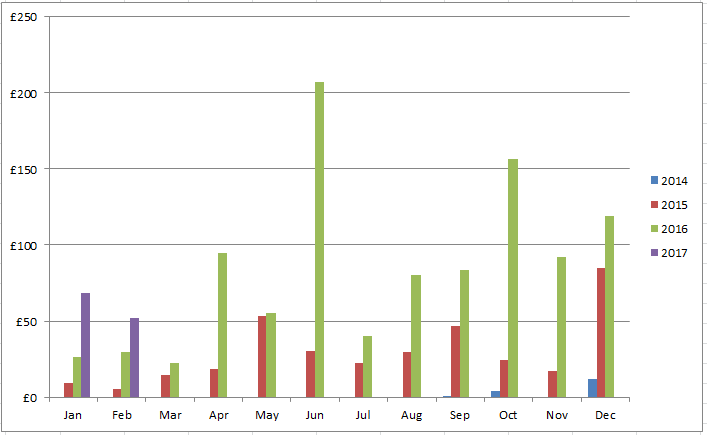 A decent year-on-year increase, though still a bit of a slow start to the year against my goal of £1,500. Total dividend income now stands at £120.29. The first few months have historically been quite low for me dividends-wise, so nothing of any real note until April I think. Good to see the first two months >£50 anyway! I also received £15.20 from my P2P and Property Crowdfunding investments. 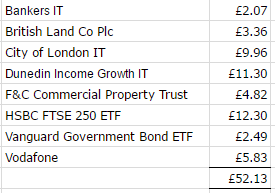 Aside from the new shares I purchased for the Dogs of the FTSE portfolio, no other purchases were made in any new shares/investment trusts – I just topped up some of my existing tracker funds. I also added to my property crowdfunding* investments using some of my matched betting profits. Current portfolio can be found here. What could have been an average-ish month of MB income didn’t turn out as well as expected due to a match postponement (Celta Vigo v Real Madrid) early on in the month – unfortunately, I had Real in many accumulators and ended up losing over £50 in profit! These things happen but I had to try to keep a clear head in trying to recoup my losses via MB and not resort to taking unnecessary risks, ie gambling. So, I made £273 in profit, which isn’t bad considering and it’s double what I earned last month. Still not great though, especially as I’ve set myself a goal to earn £4,000 this year via MB. I’ve just realised that I’ve not factored in the quiet summer months when there’s no football on – hmm, will have to see how I get on then. It’s now been pretty much a year since I started matched betting and I have now made a total of just under £4000 profit. Quite a modest sum compared to the tens of thousands which some other matched bettors rake in but I’m just really pleased about the extra (tax free) cash. Again, I’ll stress that it’s not ‘easy’ money as you need to put in effort to make the money but I enjoy it and I don’t have any other hobby which makes me money. The matched betting guide I subscribe to is OddsMonkey*. It’s a great website for beginners and experienced matched bettors alike – for beginners, there are plenty of tutorials which provide you with step-by-step guides on how to make profits and to work through special offers. They also offer one-to-one sessions for those who need a little more help. For the more experienced, the tools offered by OddsMonkey are fantastic, including the Each Way Matcher, Dutch Finder, Racing Matcher and Acca Matcher, all of which I have used successfully. There’s also a friendly forum for you to ask any questions. Anyway, you can join for free* to try it out. With a lot of time on my hands, I’ve been doing quite a bit of reading so I should hit the library book goal easily. Need to get onto reading some non-fiction soon though. So far, nothing to report on the job seeking front. I know that I could be putting more effort into looking – so many people have said to me, “Relax, enjoy your time off,” and I think I may have taken that advice too literally! I’ve continued to network and apply for a few jobs so it’s not like I’m not doing anything but I think I’m suffering from procrastination (again). Need to focus and JFDI1Just F*cking Do It. On the leisure front, I’m back on track with my gym sessions so my fitness is back up again. As mentioned in my New Year post, I’ve also started playing netball as something new to do this year. The sessions very much remind me of PE lessons (my favourite lessons at school), except that everyone actually wants to be there and play! The exercise is very different from my gym classes so should benefit my overall fitness, plus I’ve met a whole bunch of new people = opportunity to network. Am very much looking forward to attending the FIRE Escape gathering in Sheffield this weekend, which has been organised by Huw. It’ll be good to catch up with old faces to see how they are getting on with their FI and early retirement journeys, and to meet some new ones too. I’ll do a little update post on it next week. This entry was posted in Blog Update, Dividend Investing, Earnings, Expenses, Funds, Investment Trusts, matched betting, Net Worth, Portfolio, Savings, Shares by weenie. Bookmark the permalink. Regarding MB, what are the main offers you play around with after the usual sign up bonuses?? I am going for the 1-1 session next week, so will have a better idea of how to maximise offers then. I still have no idea how the various methods work. I would recommend TFS’s rinsing 888 offer. Much more fun than MB imo. Enjoy the freedom whilst it last. I do mostly football offers, so lots of accas, Paddy’s 2UP or their occasional £5 per goal offer, Betfred’s DDHH, Boylesports’ crossbar offer amongst others. Yes, TFS’ rinsing 888 offer is great and looks like easy cash but as a former gambler, I don’t think I could trust myself to have the discipline to stop when I should. I don’t want to risk my sanity for riches! I’d prefer to grind out small but numerous wins through MB – I don’t crave the thrill of the casino (or maybe I do, so I avoid it…). Hope the 1-1 went well! Hi Weenie, so you’re still putting money into your trackers, even though the markets are still so high? My philosophy is to accumulate my monthly savings into a lump sum and invest when the markets have cooled. What are your thoughts on things at the moment? Yes, I’m just putting in money every month regardless of the high market as this means that I don’t have to decide when the best time will be to invest and I get the benefit of pound cost averaging. So I buy less units when the market is high (ie now), but will be buying more when it’s low so it averages out in the long run. I’m just more comfortable investing this way. Looking good on the year-on-year dividend increases…I must look up how to do these charts as an image conveys the message better than words! Just a thought, but as you have some spare time, how about a book to help others with savings/investing? Hope the weekend goes well. The charts are nothing fancy, just copying and pasting really from either Excel or Google Sheets. Holy cow and holy crap at that same time! Fantastic savings rate, obviously. But not good that you are still unemployed on your FIRE journey. All the best in finding a job again. Yes, I know, rather than shooting upwards, my FIRE journey will slow down but hopefully not for long. When do you train/play netball? Is it an after work thing, or on the weekends? Thanks for the kick up the backside! I have to say that this week has been much better in terms of structuring my job hunting so I’ve gotten into more of a routine and timetable now. The netball is played one evening a week. It’s part of the ‘Back to Netball’ initiative which is backed by the national lottery to get women back into sport and to improve both fitness and social well being. Did you play/used to play too? When I was on the school teams, I played Centre – my older legs prefer Wing Attack these days, less running haha! I played many years ago as a teenager. I was never any good, but it was always fun. I played Goal Keeper, because I used to be tall and spindly! One night a week is a reasonable commitment. Netball is primarily run on Sunday mornings in NSW, with training during the week. That’s more time than I want to spend. I should look around for an indoor comp. that wouldn’t require so much investment. Also, now I’m getting a bit fitter again, I might be able to step out on a court. If you want to up the MB profits a bit take a look at William hill 4 means more offer. You can win about 80 quid with just one back and lay (Although it won’t come in every time). I would imagine this will appease the gambling beast somewhat too as it’s a bit of luck whether it comes in or not. It came in on the Bayern game last night for example. Second to that for a big win paddy power 2 up offer looks great although the chances of that triggering are much lower. Check out matched betting guys post on it. For me it’s all about finding offers with the biggest payout and smallest effort and those two fit the bill nicely, and both are a bit of a punt as well so are fun to boot. Yes, I’ve been doing WH’s 4 Means More offer, only come in a couple of times and I missed out on the Bayern game last night as I was late coming home from the gym! I’ve been slowly increasing my horse racing MB, doing WH’s Hi5 offer which has seen profits increase. I hope to take advantage of Cheltenham – I didn’t take part in the festival at all last year as I was a newbie at MB having just started the week before. Haha, the ukulele playing is going well thanks, I can play a couple of tunes now (imperfectly!) but I’ve discovered something: I already know that I can’t sing (in tune) but I’ve discovered that I can’t sing and play at the same time – my brain currently can’t cope with this type of multi-tasking but apparently it takes a lot of practice so I will keep going! Hah. Exactly the same as! My brain can’t cope with doing two things at once. I think it is something you can practice at to nail eventually but also I think there are others that can just do this naturally (or at least with less effort practising). I’m a lazy so and so, so I find if I don’t see some sort of progress early on in an endeavour I tend to give up. Good job saving money has got a low barrier to entry and a shallow learning curve eh! Thanks for stopping by. The FIRE movement in the UK continues to grow although it’s got a way to go before it catches up with the US. That is a great way of looking at finances, ie surplus = profit! Good luck with your FIRE plans too.